The Terra Natura Zoo in Benidorm offers a one-of-a-kind experience to all that walk through its doors. There are 320,000m² to explore full of exotic animals hailing from four continents. Get closer than ever with invisible barriers. Spend a splendid day at the zoo in the Costa Blanca with the whole family. Dive head-first into a wonderful world of exotic animals in the Costa Blanca. Benidorm Zoo is open all-year round and invites animal lovers to come and see the animals with invisible barriers, so you can really feel like you're up close and personal with the wildlife. Get as close to the animals as possible whilst keeping yourself safe with the invisible barriers. There are over 1500 animals from 200 different species in the nearly natural environment. Go and see the animals on the Costa Blanca and stroll around the different sections in Terra Natura Zoo which have been separated into four continents – set your eyes on everything from elephants and lions to toucans, frogs and monkeys. With the combination ticket you are well equipped: a visit to the Terra Nature Park and fun in the beautifully landscaped Aqua Natura Water Park. The ticket is valid for a one-day visit to both parks. Aqua Natura Benidorm opening hours: From 11am-5.30pm in Apr, May and Oct, from 10.30am-6.30pm in June (and until 7.30pm on weekends), from 10.30am-7.30pm from July to the 2nd Sept, from 10.30am-6.30pm from the 3rd to the 16th of Sept and from 10.30-5.30pm from the 17th Sept to the 31st Oct.
Visit the zoo and the water park in Benidorm in one day and get in addition to the entrance tickets a menu and 2 drinks. The catering voucher is redeemable in one of the two parks. You are allowed to bring your own food to Terra Natura Benidorm; we welcome to use the picnic areas. Although cans and glass bottles are forbidden. Group discounts are available for parties with more than 20 people. Parking is € 5 per car. The Terra Natura in Benidorm is a far cry from the average zoo. It’s a modern zoo with almost invisible barriers so you get to see the animals in a near to natural environment. The zoo in the Costa Blanca does their utmost to make sure the animals are well looked after and happy. Benidorm Zoo has been divided into four sections: Pangea, Asia, America and Europe. Pangea is full of exotic and often poisonous animals like snakes, frogs and tarantulas. Find out how they use their poison to protect themselves and kill their prey. Move on to the Americas section in Terra Natura in Benidorm to see jaguars, ocelots and a massive aviary which is reminiscent of a tropical rainforest. Set your eyes on wildlife native to Europe like deer, wild boar and mouflon. The Asian area is home to one of the largest herds of elephants in Europe as well as Indian rhinos, which are rare in Spain. The Terra Natura animal park has some big cats as residents too – be ready for tigers and leopards. Find out all kinds of information about birds of prey as you get seats to a show. The mascots get the kids smiling with their tricks through summer, as does the playground. You can watch the animals being fed to see what kind of grub they munch. Some of the animals can even be stroked in the animal encounter enclosures. Stroll through the extensive grounds of the Terra Natura park in Benidorm and learn about the behaviour and habitat of the animals that live there. All the walking and learning can make you a bit hungry. Bring along a picnic and sit on the grass with your loved ones. Let the fantastic range of flora and fauna at the Terra Natura park take you to another world for a few hours. Natura animal park in Benidorm take you to another world for a few hours! We know that you’ll have a fantastic day out in Benidorm at the Zoo. Keep an eye on the opening hours because they change them based on the time of year and book your tickets to Terra Natura online for the best price. Valid on the reserved day or for 12 months after date of purchase if no date has been selected. 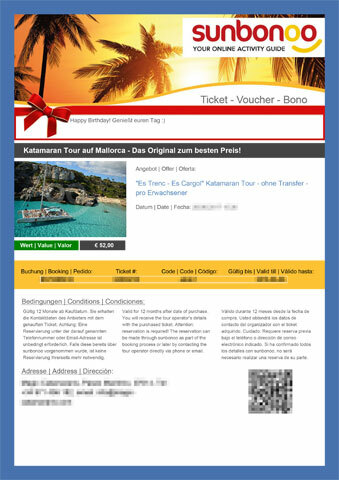 You will receive the tour operator's details with the purchased ticket. A reservation is not required but we recommend checking opening hours before going on the tour/excursion. You're reviewing: Go to the zoo in Benidorm: Get close to animals on the Costa Blanca. How do you rate this product?